Great art remains relevant for years. Real masterpieces can gain relevance over time. 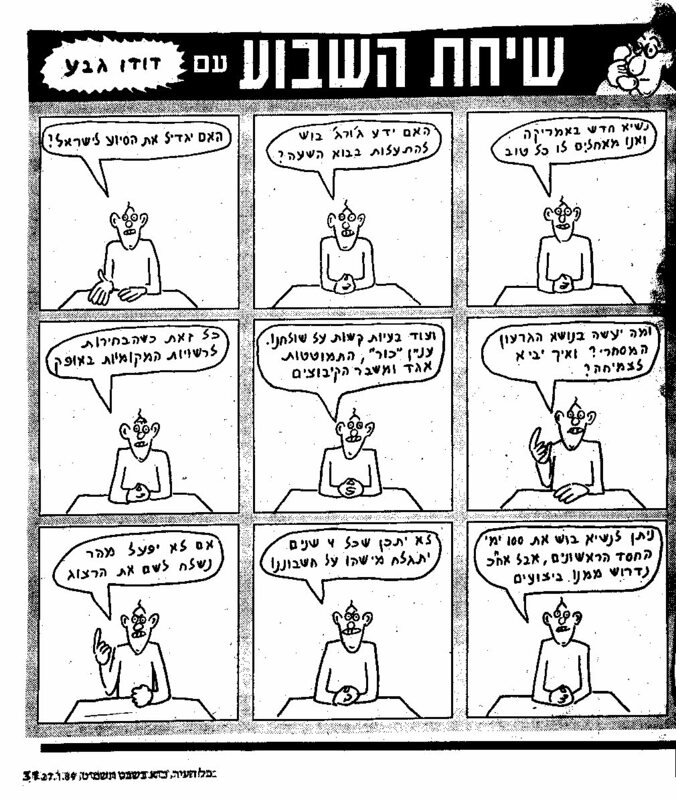 But these two pieces by my childhood comic books writer idol, Dudu Geva z”l, that I clipped from Kol-Ha’Ir (Jerusalem’s local newspaper) as a child some 24 years ago, are nothing short of divine inspiration and prophecy. The writings under the images offer an English translation, but don’t forget to read them from right to left (and top to bottom…). (6) All that, while the municipal elections are approaching (5) And there are other tough issues to deal with. Kur [a large and failing union corporate], the collapse of the [bus corporate] Egged, and the [financial] crisis of the Kibbutzim (4) And what will he do about the deficit in the trade balance? And how will he create growth? * Literally, “shaving himself on our account”. ** In Israeli politics, the authority of the president is largely symbolic. In election times, he nominates one of the leaders of the major parties to the task of forming the new government; if he succeeds in time, he becomes prime minister. Deciding on which leader shall be given the chance to form a government was meant to be a trivial task that does not require much judgement, but on two occasions during the 1980s, in the elections of 1984 and 1988, as well as during the later political crisis of 1990, the stalemate between the Labor and Likud parties has made president Herzog a de-facto kingmaker. In this context the threat to “send Herzog” meant to take care to nominate a new American president. A genius and a great human being. I get sad just thinking about him.